Spicy Barbecued Burgers, easy dinner recipes. Summer is Burger Season! We normally don't bother with buns - unnecessary calories in plain white bread... Which we can't get here ;-)) I do try to make a variety of burgers over the season. Substitute ground turkey if you like. Put beef, chili powder, garlic powder, chilies and 1 tbs ketchup into a large bowl and mix well. Shape into 3 - 4 patties. 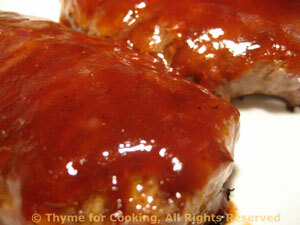 Cook on barbecue grill for 4 - 8 minutes per side, or until done to your liking. Barley is a healthy alternative to rice. With the feta, shallots and olives, this is a flavorful side dish. Cook barley in stock until tender and stock is absorbed, about 15 minutes. Heat oil in a medium skillet over medium heat. Add onions and sauté until tender and starting to brown. Reduce heat and let brown slowly until barley is done. 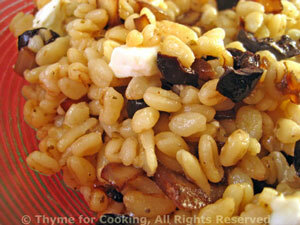 When barley is done, add shallots, feta and olives. Sliced thinly and cooked in a sweet and sour glaze, these luscious carrots complement any meal. Slice the carrots very thinly. In small skillet heat the stock, vinegar, sugar and butter. 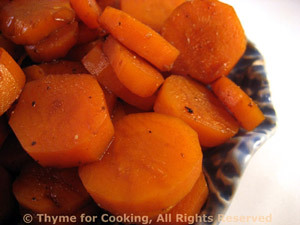 When simmering add the carrots, cover, reduce heat to low and simmer for 10 minutes. Uncover and cook off any remaining liquid. Serve.